Make sure you have researched the sixth form you are applying to. Do they offer the programme you are interested in and do you have a reasonable chance of meeting their entry requirements? If you need more help, see my post about choosing a sixth form. Check you understand the application process and deadlines. 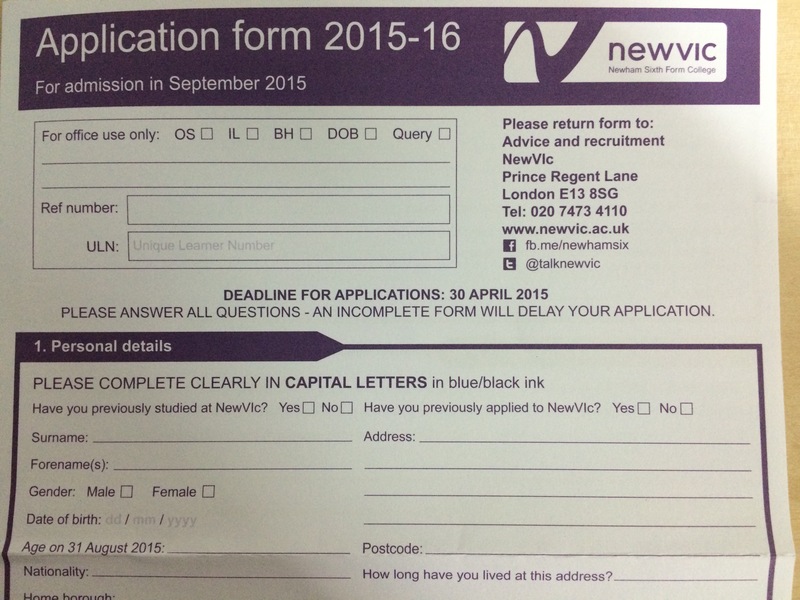 Read the application form carefully to see what is expected from you, fill in the easy bits such as personal information. Do a first draft of any section which requires longer responses or choices. Tell us about your ambition; where you see yourself in 5 or 10 years – we’re not going to hold you to this. Don’t worry if you have more than one option or if you’re genuinely not sure. Justify your choice of programme in terms of your ambition and your interests. Tell us what you’ve most enjoyed studying at school, including coursework or research projects you found particularly interesting. Have you researched what degree course you might want to progress to at university and what their requirements are – subjects and grades? If you’re not sure where you are heading, have you made sure that your choices keep your options open? Tell us about yourself, give us a sense of what you are interested in, what you are passionate about, what you enjoy doing and why. We are really interested to know about the achievements and skills you are most proud of; a sporting achievement, playing a musical instrument, performing on stage, designing games, writing a story on Wattpad or in the school magazine, organising an event, coaching, volunteering, some kind of leadership activity, things you learned on work experience etc. We are interested in what you have learnt from your involvement in any extra-curricular activities such as Duke of Edinburgh, Prince’s Drawing school, Woodcraft Folk, Scouts, Guides or church or mosque youth groups. All of these are opportunities to demonstrate your commitment to helping others and contributing to society. Give us an idea about what activities you might want to take up or continue with at college. Tell us about something you’ve read or a lecture you attended and why you enjoyed it. What appeals to you about a particular writer or genre such as science-fiction, horror, historical fiction etc. Don’t forget to tell us about all the languages you speak. Being multilingual is a real asset and will help you throughout your studies and in employment. Send it off in good time! Over the years I have read thousands of college applications from year 11 students and the best ones are those which are complete, legible, well considered and which give us a strong sense of the real person behind the form. Together with a good school reference, a strong application sets the scene for a really helpful interview. And that will be the subject of the next post in this series. This entry was posted in Education, Learning resources, NewVIc, Parents, Students and tagged Colleges, Education, information advice and guidance, Sixth form, Sixth form college, young people. Bookmark the permalink. Useful information from a college principal about how to fill in your college application form.